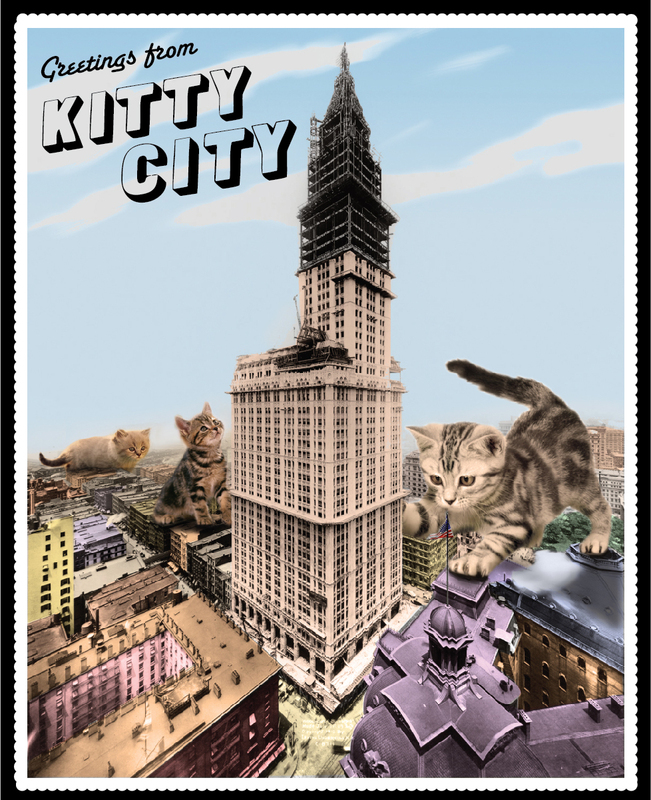 Kitty City is an inter-generational experiment in collaboration and pedagogy, designed to encourage shared decision-making power and challenge the way we think about the urban environment. During four workshops in May, we will design buildings, thoroughfares, and other urban elements to meet our strict zoning standards for living the good life. We’ll plan parks; devise water, transportation, and sanitation systems; map out housing options, commercial and cultural districts; and be sure there’s plenty fresh and healthy food. After our shared vision is approved by committees and review boards, we’ll build Kitty City in the Flux Gallery. On June 1st, we’ll flood Kitty City with kittens during a ribbon cutting ceremony that will double as an adoption drive. If you are a student who would like to help build Kitty City, please contact Doug – doug[at]fluxfactory.org. Workshops will be three hours on every Saturday in May. Flux Factory is excited to partner with For Animals, Inc., who will provide Kitty City with its inhabitants, and host the adoption event at Kitty City on June 1st. For Animals, a no-kill animal shelter in South Ozone Park, New York, is dedicated to eliminating companion animal homelessness, engaging our larger community as vital and active participants in this shared social and ethical responsibility, and providing that community with the resources and education necessary to achieve these goals together. For Animals, Inc. is able to offer adoptions free-of-charge, through their participation in the fourth Maddie’s Pet Adoption Days, sponsored by the Alameda, CA-based Maddie’s Fund. There will be no lag time in the adoption process and new owners can leave with their Kitty citizen on the same day. We’ll also be joined during the adoption drive by Neighborhood Cats, whose mission is to reduce feral cat overpopulation and improve quality of life for free-roaming cats using the method known as Trap-Neuter-Return. At Kitty City they will be ready to talk to visitors about their work in NYC and beyond, explaining how TNR is the best and most effective solution for cats and communities. This exhibition is supported, in part, by National Endowment for the Arts, the New York City Department of Cultural Affairs in partnership with the City Council, and the New York State Council on the Arts with the support of Governor Andrew Cuomo and the New York State Legislature. Limited Edition, letter-pressed and hand-assembled.